Do you remember the puzzle about the man who had to get a fox, a chicken and a bag of grain across a river? (If you don’t it’s here). At first glance it seems simple but you can quickly tie yourself in knots trying to work it out. I thought of that riddle during a conversation with a client about the logistics of taking your dog for a walk when you have a baby in a pram. It was something she hadn’t given more than a passing thought to until she tried to do it alone for the first time and then the complications hit her. How to get the dog, the pram and the baby out of the house safely? In what order? Pram & baby first, then leave them outside while you go back for the dog? Or dog first, tie it to something, then run back in for pram & baby? How to manage a lead and steer the pram at the same time? Oh, and the dog nipping at the wheels just added to the fun…. Practice - some practice walks with the pram and your dog before the baby arrives will help you feel a bit more prepared and let you see what training you might need to do with your dog while you’ve still got some time & energy. And, yes…you will feel daft pushing an empty pram but hey ho…. Wait – teaching your dog a strong ‘wait’ behaviour will make getting you, pram, baby & dog out of the house safely so much easier. 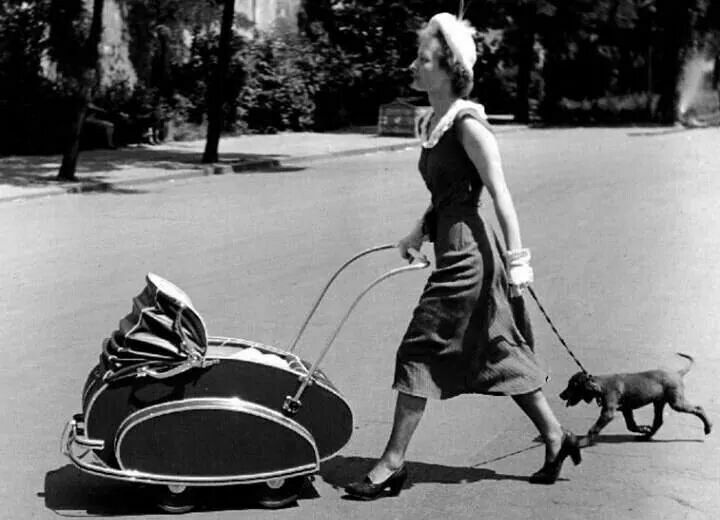 You can get the pram & baby sorted while your dog waits his turn. Again, do this before the baby arrives….you won’t have the energy, patience or time to do it afterwards. Lead – no extendables, no long lines...they don't offer enough control. Consider using a lead attached to a waist belt or worn across your body to leave you completely hands free. If your dog’s a puller consider a harness with a front ring as well as a back ring…power steering for dogs! Sling – do you really need to take the pram? Consider a papoose or sling instead. Safety – don’t attach the dog to the pram. Ever. Never. Not ever. Reward - Keep a supply of treats in one of the pram pockets. When your dog is walking on a loose lead by your side reward, reward, reward. Just Do It – don’t let the logistics overwhelm you. Something as normal as a walk in the fresh air will do you, your dog and your baby so much good.